Siddal led the way as a string of amateur sides embarrassed Kingstone Press League One opposition in the Ladbrokes Challenge Cup yesterday. 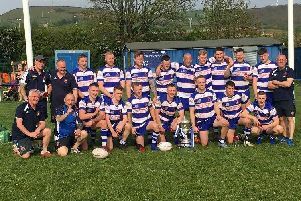 The Chevindge men were the most emphatic winners, humbling visitors Newcastle Thunder 30-4, and they will be joined in Tuesday’s fourth round draw by Rochdale Mayfield, Kells, Pilkington Recs and Featherstone Lions. Gareth Greenwood’s side had laboured against Northumbria University in the previous round a fortnight earlier but were a completely different proposition against professional opposition. Two-try loose forward Byron Smith was the star of a rock-solid, largely error-free display against bigger but toothless opponents. “It was a pretty special performance,” said coach Gareth Greenwood, whose brother Lee was in charge when Siddal won 26-0 away to Doncaster six years ago. However, Siddal’s day was marred by the sight of centre Scott Caley being stretchered off to hospital, victim of an alleged off-the-ball punch after 27 minutes. The game had to be held up for 15 minutes and the start of the second half was delayed while medical equipment was returned to the side of the pitch. It only prolonged a miserable afternoon for the visitors, whose defence was breached after just four minutes by second row Tom Garratt, Gareth Blackburn adding the conversion. Siddal’s intense approach, backed by Chris Brooke’s sound kicking game, meant the visitors were unable to get into their stride. Prop Vincent Rennie made a rare Newcastle break and loose forward Jason Payne carried the ball to within a yard of the home line but there was precious little else to concern Siddal, who continued to have the upper hand. Caley was left motionless on the floor after Siddal had launched a high kick. Visiting centre Darrell Olpherts and Blackburn were involved in a dust-up as result and both were yellow carded. A lengthy wait in the cold seemed to have little effect on Siddal, who moved out into a 14-0 interval lead with a Smith try converted by Brook and then Blackburn’s straight 35 metre penalty for holding down in the tackle. Newcastle put the kick at the start of the second half out on the full, an act which summed up their afternoon. Smith, labelled “a bit of an animal” by his coach, showed tremendous strength to batter off several tacklers and go under the posts for another six-pointer. A Siddal game rarely goes by without stand off Shaun Garrod making a mark and he slipped through for the home side’s final try with six minutes left. Newcastle finally got on the scoresheet via second row Dan Parker, who touched down wide out with three minutes remaining but there was little in the way of celebration.